The author is a commercial hay grower in Moses Lake, Wash., and has his own advertising business. Last November, I was fortunate to be able to attend the Western Alfalfa & Forage Symposium in Reno, Nev. This is an annual event largely coordinated by the California Alfalfa & Forage Association with help from several other state-level alfalfa associations and extension specialists. The symposium highlights hay production practices and concepts that Western alfalfa growers face in their operations. At this year’s event, exhibitors packed the ballroom floor at the Grand Sierra Resort while industry professionals and growers gave presentations covering a range of topics, which included enhancing crop yields, center pivot efficiencies, and market status reports. The first day of the event consisted of an Alfalfa Hay Quality Workshop that highlighted the importance of pulling forage samples and described how to interpret the data you receive from the lab. Also covered in the workshop were ways to balance forage yield and quality and insights as to what dairies are searching for when they go to purchase hay for their feed rations. The next two days of the event covered a wide variety of topics that addressed grower needs and industry issues to consider as we head into the next growing season. 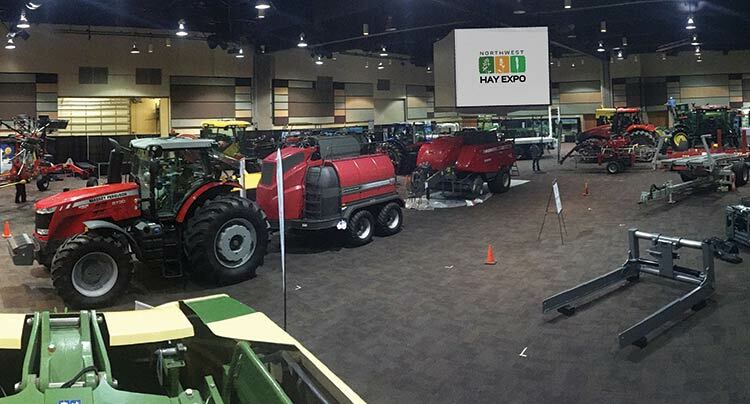 Exhibitors inside the ballroom ranged from equipment dealers to irrigation specialists to hay exporters; each was vying to show attendees how their product could be beneficial in a forage operation. Overall, it was a great event. People fail to see how much these associations do for the growers and members they represent. Associations are not just a board of directors getting together, eating lunch, and telling stories; they are planning and giving their members a voice inside of local, state, and national government. They take a stand on a wide range of policies and bills that affect the forage industry and support like-minded groups with the same ideas, goals, and visions. Associations provide a platform for growers to be heard, which can sway discussions on a larger scale. Forage organizations and associations often support research efforts within a state or region; this may even include variety performance trials that help to identify the seeds that will perform best in a locality. Hay is a nonsubsidized commodity that doesn’t realize the public attention garnered by most other major crops. Associations help to educate hay consumers and the general public about how important hay and forage production are to the economy and the environmental benefits to land and water that are inherent in forage production. Many associations also provide scholarships to individuals who are pursuing degrees in agriculture or related fields. Providing scholarships to those who are the next generation of growers and agribusiness professionals helps to ensure an educated workforce in the future that can make science-based decisions. Expos and symposiums give growers and industry professionals the opportunity to build and grow their operational networks. Businesses are able to showcase products to some of the best producers in the industry. Growers benefit from the educational sessions, which help them assess their operation and find ways to produce a better product, be more profitable, or boost efficiency. For exhibitors and supporters of symposiums, these events bring brand awareness, network connections, and grower feedback to the products and services that they are offering. Face-to-face feedback and interaction is critical when it comes to assessing clients’ needs, concerns, and wants surrounding their service. Exhibitors also benefit from brand recognition on signage or marketing materials included with registration materials. The biggest draw and advantage of attending these types of events, for both growers and exhibitors, is the interaction with people. Networking and building relationships are key elements for the success of any business. Major educational events offer growers the chance to sit among the CEOs of major companies, giving each group a unique experience to interact and share their ideas. Hay and forage associations provide a valuable opportunity and educational resource that I believe are underutilized by many growers and agribusinesses. By providing data, information, and networking events, they can help expand and build your operation or business with a minimal investment of time and money. This article appeared in the February 2018 issue of Hay & Forage Grower on page 12.